The Acerra family is big. Sixteen children big. And with twelve sons, big enough to form their own baseball team. Which is exactly what they did. From the 1930s-1950s, this band of brothers played semi-pro ball and competed all throughout New Jersey. Despite the fact that from the 1860s - 1940s, there were 29 known all-brother baseball teams, the Acerras made history by playing longer than any other. Audrey Vernick tells their story with great care and admiration for their accomplishment. Truth be told, I don't even really like baseball that much. I picked up this book because I adore Audrey's writing. She has shown time and again that for her, it's not just about the story. She works really hard to craft a narrative full of voice: whether it's silly humor in her Buffalo books, or quiet respect and reverence as with her nonfiction picture books like She Loved Baseball and now Brothers at Bat. And to write such a brief narrative full of voice is no simple task, but Audrey is a master at it. From the opening sentence, Audrey sets the perfect tone to help the reader settle in and enjoy the journey. Often when I read picture books to my sixth graders, not everyone enjoys the stories. There's always a handful of students who have something critical to say. But with every Audrey Vernick picture book I have read, each one of my students have always written glowing responses. Brothers at Bat was no different. "The best part was when all the brothers came home safely. That part was really good. My other favorite part was when the bus broke down and the brothers started playing baseball in the sweating sun." "I really enjoyed the book and I don't even like baseball. I don't know why but I felt like crying, it was like emotional for me... what I want to know is how the parents kept up the money to support them." "My favorite part of the story was when Alfred came back after he lost an eye and he still was a good catcher." "I love Audrey Vernick's stories... That would be so interesting to go talk to the Acerra brothers that are still alive. That is also amazing that Alfred came back and played on the team with one eye. I thought it was just a cool story overall." As far as the illustrations go, Audrey Vernick manages to luck out with amazing illustrators for all of her books. While my favorite illustrator of her books continues to be Daniel Jennewein for my own biased reasons, Steven Salerno is no slouch either. He captures the endearing and friendly qualities of the Acerra family in his illustrations and after reading the author's note about Freddie inviting Audrey over for dinner to interview him for this book, and reading the end of the book where even a broken down bus doesn't get them down, I don't doubt the Acerra family is anything but delightful. So have I gushed enough? There's not much more I can say after that. 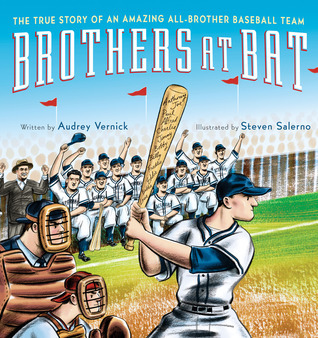 If you're a baseball lover - or even if you're not - go out an get a copy of Brothers at Bat today. Awesome reviews from the mouths and minds that matter! "I really enjoyed the book and I don't even like baseball." Audrey loves baseball and it shines through every one of her baseball books! I just saw this yesterday! I'm glad to see it gets such a good response, and love the picture of the essay you published - not only fun to read but holy cow, what great handwriting!